How do teens find health information? Teens need a reliable source of no-nonsense health information—whether they are wondering about their own health, concerned about a friend or family member, or writing a report for school. 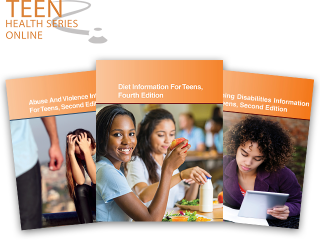 The Teen Health Series is a specially focused set of volumes within the Health Reference Series that was created to help teens find the health information they need. The Teen Health Series is a leading resource for librarians, teachers, and students who are looking for medical information that is authoritative, well-organized, and easy-to use. Each volume deals comprehensively with a high-interest topic, with a detailed contents section that will lead readers directly to the information they need. Each volume includes articles on a wide range of relevant topics written by authoritative sources. These articles are written in a straightforward, easy-to-read style, with headings, sidebars, definitions, and illustrations that break up the text and convey facts in different ways. Teens and other readers will find the volumes in the Teen Health Series to be excellent resources for reference, research, and personal information. This leading health resource for young adults now includes online access in Health Reference Series Online. Purchase any Teen Health Series print volume and automatically receive FREE online access to that same high value content. Health Reference Series Online is also available as an online subscription that provides online only access to all current and future publications in the Teen Health Series as well as all titles in the Health Reference Series. Provides basic consumer health information for teens on diet, nutrition, weight control, and related medical conditions. Drug Information for Teens, 5th Ed. Provides consumer health information for teens about drug use, abuse, and addiction, including facts about illegal drugs and the abuse of legally available substances found in over-the-counter medications; describes drug-related health risks and treatment for addiction. Includes index, resource information and online access. Eating Disorders Information for Teens, 4th Ed. Provides consumer health information for teens about causes, prevention, and treatment of eating disorders, along with tips for healthy eating. Includes index and resource information. "This is an excellent resource for teens, parents, counselors, and social workers." "Outstanding information on various teen health issues, presented in an easy to read manner. ... An excellent source for any health curriculum. This series is well done and truly high school level reference." "Excellent—and stridently non-patronizing. Omnigraphics' Teen Health Series ... typically spends around 400 pages on a given topic. These weighty tomes allow teens who may be looking for, say, pregnancy information to go away fully informed."